West Asian astronomers had been world leaders in astronomy for thousands of years before the Islamic conquests in the 600s AD. In the last centuries BC, West Asian astronomers had already figured out that the earth was a ball, and that the earth went around the sun, and how big the earth was, and that the moon went around the earth. Astronomers already understood lunar and solar eclipses. But there was one big problem. If the earth really went around the sun, astronomers should see parallax from the earth’s motion relative to the stars – and you can’t see it with your naked eyes. Therefore, either the earth really didn’t go around the sun, or the stars were so far away that the parallax was too small to see. But that would mean the stars were *really* far away – the nearest star would be trillions of miles away. Astronomers just couldn’t believe that the universe was that big (even though the nearest star really is about 24,800,000,000,000 miles away – almost 25 trillion miles). Under Roman and Sassanian rule, scholars like Ptolemy went back to thinking that the sun and planets went around the earth. But after the Islamic conquests, astronomers began to think about this problem again. Indian astronomers like Arya Bhata about 500 AD renewed the idea that the earth spun around on its axis to make day and night. About 900 AD, Al Razi continued Arya Bhata’s work to show that the sun was bigger than the earth and the moon was smaller than the earth. Just before 1100 AD, Al Ghazali was able to show what caused lunar and solar eclipses again. Along with these observations of the planets and the stars, Islamic scientists like Ibn Sahl in the 900s AD also improved our understanding of how lenses work. Ibn Sahl drew diagrams showing how light passing through glass or water is refracted (bent) and emerges at a different angle. In the early 1000s, Ibn al-Haytham al Basri continued this work on optics in Cairo, figuring out how this light reached your eyes. Al-Haytham’s Optics reached and influenced astronomers all the way from Europe to China. In 1260 AD, another Islamic astronomer, Al Tusi, figured out that the Milky Way was made of hundreds of stars, but he thought they must be very small stars, not realizing how far away they were. Cite this page: Carr, K.E. 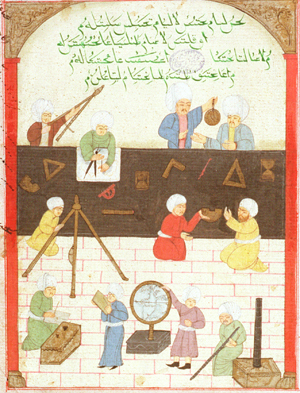 Medieval Islamic astronomy. Quatr.us Study Guides, July 27, 2017. Web. April 20, 2019.